While most routine blood tests measure 25-35 different values, our blood test measures 55 different values. Checks blood sugar levels, which may indicate prediabetes, diabetes, hypoglycemia, and other possible imbalances. Evaluates kidney and liver function and ability to filter waste out of the body, checks for appropriate mineral levels that aid in maintaining hydration, regulating heartbeat, assisting nerve and muscle function, balancing the body’s pH, promoting bone health and growth, and maintaining energy storage, checks blood protein and your bodies ability to produce bile which helps to digest fats, overall health of organs, minerals and enzymes. Screens for liver disease or damage caused by diet, drugs, alcohol and/or the use of medication. Analyses the function of enzymes in the liver. 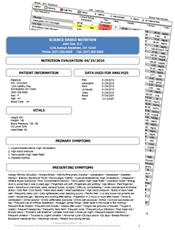 Evaluates thyroid function, provides information to diagnose thyroid disorders such as hypo/hyperthyroidism. Measures total cholesterol, individual cholesterol types (LDL, HDL, VLDL) and cholesterol type ratios. Measures the levels of fat carried in the blood, that may increase the risk of coronary heart disease, and other potential health problems. Evaluates overall health and detects infections, anemia, leukemia, and several other conditions. Measures the amount of iron stored in the body. Low levels may indicate your body is iron deficient and elevated levels may indicate hemochromatosis, a condition that causes the body to store extra iron. Hemochromatosis is linked to joint pain, abdominal pain, fatigue, weakness, diabetes, low libido, impotence, heart disease and liver disease. Detects inflammation in the body that can be linked to autoimmune diseases, infections and cancers. Produced in the liver and when combined with other tests, is used to evaluate an individual’s short term or chronic inflammatory condition. An elevated level of creatine kinase is seen in heart attacks, when the heart muscle is damaged, or in conditions that produce damage to the skeletal muscles or brain. Our immune cells contain receptors for vitamin D, therefore vitamin D is crucial for a properly functioning immune system. High levels of Vitamin D can slash your risk of cancer by 60 percent and help prevent 16 specific types of cancer. It is able to reduce the risk of type 2 diabetes and other age-related degenerative diseases such as osteoporosis and Alzheimer’s. Vitamin D also exhibits infection fighting abilities. It is essential for optimal health. Unfortunately studies reveal that 85 percent of the population have insufficient levels of vitamin D.